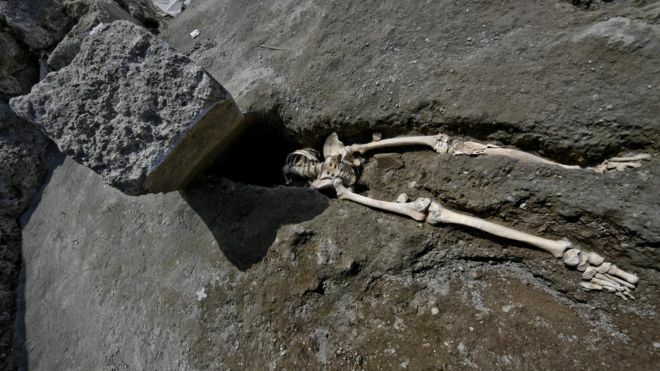 Archaeologists at Pompeii have uncovered the remains of an unfortunate man who was decapitated by an enormous rock while fleeing the volcano. Nearby Mount Vesuvius erupted in 79 AD, killing many Pompeii residents and famously freezing them in place. This skeleton appears to be from a man who survived the initial explosion and was fleeing the doomed city. A leg injury, however, may have slowed him down before he was crushed by the huge stone hurtling through the air. Apparently they haven’t found the head of the unfortunate individual. Pompeii really is the most startling place. There’s the entrance to a yard where, inlaid is stone in Latin is the inscription ‘beware of the dog’. A few yards away they found the mummified (correct term?) skeleton of a dog. Gives one a feeling that it could all have happened yesterday. Apparently, the ongoing excavations at Herculaneum are even more startling. It'll be interesting to see the results summarized once the current excavations finish - I think around 2020. Program about Pompeii this very evening at 9:00pm on Channel 5. Being Channel 5 there’s no guarantee of quality. Could be along the lines of Aliens Resposible For Volcano That Destroyed Pompeii. I didn't notice the stone but I can never forget that dog! That whole sight is like the time stayed still for that horrific moment. Either way, Vulcan had that man marked. Bet he never thought the world would be talking about him in 2018. Victims of Pompeii... bear with me, I'll get to the point. I work as an event decorator. I do not set up tables, chairs, or tents. I decorate with theater style props. You need a 14' tall by 30' wide scenic backdrop of the Rocky Mountains? Got it. You need a 20' tall green alien? No problem. And here's the problem... I have now decorated three or four high school dances in the theme of PROMpeii. This theme has only happened since the movie Pompeii, a few years ago. The decorations consists of a 14'x28' 3D temple facade. 8'x4' friezes of gods and creatures. Numerous Ionic and Corinthian columns 8' to 12' in height. Oh... and also.... fake flames... a lava flow... debris and broken buildings. "Good evening, North High School. 20,000 people died to bring you this prom. Let's dance!" This is America so... students like to often have the latest James Bond movie as a theme... but I cannot use any licensed depictions of James Bond with a gun. Kids might get the wrong idea. They also like Pirates of the Caribbean as a theme... again, no weapons... even on the pirate flag. Speakeasy/Gangster... no weapons. Illegal drinking and gambling are fine for minors, but don't show a mobster with a tommy gun. Titanic is popular. A woman lies to her mother and fiancee. Has a one night stand with a stranger. Steals her fiancee's treasure. Lies to her rescuers. Abandons her mother and fiancee. Lies to the searchers and makes sure no one else in the world could ever see the beauty of the treasure ever again. Oh... and a thousand people died to bring you this prom. Teachers and administrators cover their you know whats so they can't be inciting violence. But 20,000 deaths from Pompeii, 1,000 deaths on the Titanic, underage drinking, gambling, and prostitution are fine. I don't think he was any luckier or unluckier than the others really, they all got killed by the eruption. I suppose if his wife had left him the night before and when he got up in the morning his dog died it would have made a good country song.